Both James and Evelyn have suffered from eczema from very young. James seems to have outgrown his mostly with just a few patches flaring up now and again in the summer. However Evelyns seems to be showing no signs of disappearing any time soon and we have tried LOTS of creams from the doctors with not a lot of success. So when we were recently offered some Bioskin Junior products from the lovely people at Salcura I jumped at the chance but I was quite skeptical if it would really help. "Bioskin Junior Active Therapy range is a two-step system ideal for those prone to eczema, psoriasis and severely dry skin. Designed for use by children and babies aged 3 months and over, and by anyone with very sensitive or delicate skin. Using only naturally active ingredients, they work with the skin to aide its own natural healing process." As you can see from the range above there is something for every situation for day to day use. 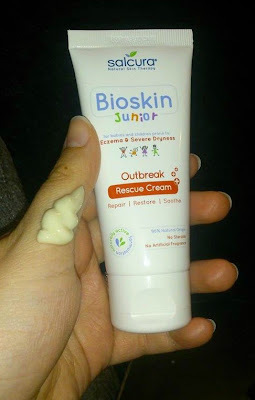 The outbreak rescue cream was the one I was most intrigued to try, we have been given steroid creams by the doctors before which do help clear up flare ups but these can only be used for short periods of time, then once we stop using it the flare ups usually return soon after. The outbreak cream is a replacement for these steroid creams and unlike steroid creams there is no time limit on usage and it can also be used on the face! It has a thick smooth texture that applies easily and gently to the skin. The outbreak rescue cream uses 96% natural ingredients and contains no steroids or harsh chemicals. Another product included in the range was the Bioskin daily nourishing spray and I immediately thought what a great idea having a spray is! Evelyn is now a very wriggly 11 month old who does not sit still long enough for me to rub cream in (and its probably quite sore when her eczema is bad). The daily nourishing spray contains Sea Buckthorn for nourishment & cell regeneration, English Lavender to calm & balance, and Rosemary for its ability to support collagen development and eliminate free radicals. The spray was also easy to apply and very quick to absorb into her skin which meant no waiting around for cream to dry or absorb as this was just a few minutes. We will definitely be using this daily from now on. All of the bath items (the bath milk, face and body wash and conditioning shampoo) were great. They had a fresh gentle scent that didn't smell chemically or overpowering at all. They all were a great addition to our normal bath time routine and definitely made Evelyn's skin feel smoother and softer (including her hair!). 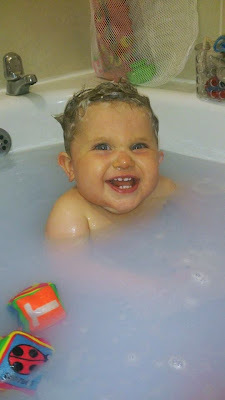 I did feel the bath milk was quite pricey for how much you received as it did get used up quite quickly as Evelyn often shares a larger bath with her brother so we used more of the product, however it did work so this was just a personal opinion. I have to the products REALLY worked! After only 1 week of using the products Evelyn's eczema had clearly visibly improved. Her skin was a lot less red and rough, much smoother and softer and she was no longer going mad to itch every 2 minutes. If you are undecided about trying the Bioskin products, Salcura even offer a 30 day money back guarantee so if within this time you decide the products don't work for you and you are not 100% satisfied then you can contact Salcura for your money back! You can find out more about the entire Bioskin junior range via their website here - www.salcuraskincare.com. Have you or your children ever suffered with eczema or severely dry skin? Both my kids suffer from eczema but my boy who is 4 seems to be outgrowing of it and get patches now and then. However my little girl is suffering from severe eczema and I've recently bought the spray and rescue cream to try on my kids. It seems to work better on my boy but not quite so on my girl. But then today is only the 3rd day of trying so I wondered whether I should give it a bit more time? The eczema on my little girl is still quite red and sore. May I ask how long it took to see the improvement on your kids? Any advice is much appreciated.